I have had a long, torrid relationship with the notion of coherence, in film and other art forms as well. Coherence has always been important to me, but when I was twenty it was everything. As an early film-goer, ideological clarity was my mental gatekeeper, separating the great films from the nobly flawed, the pretty good, and the just plain awful. In those college days, I would walk out of a theater and call a film great if I could neatly explain the general thrust of the film’s message within the hour. If I could not do this, then obviously the film’s theme was confused or it just didn’t have one. I remember walking out of Triplets of Belleville in my third year and thinking that I had just seen something strikingly beautiful and funny and arrestingly strange, but I could not bring myself to give it a four-star grade. I was hungry for something clear, and this bizarre, bewitching, sardonic little imp of a film had left me feeling confused. Even at that time, I deeply enjoyed that confusion, but I couldn’t reconcile it with my feeling that a great film should have a certain rigorous coherence. A great film was to be judged on its ideas and I had no clear handle on what Triplets‘ ideas were. I could pick out a lot of the emotional core: loving one’s kin and sacrificing everything for family and feeling appreciation for our loved ones. But it all felt like less than a comprehensive thesis. This twenty-year-old was contemplative and sober-minded and deadly serious about movies and he wanted an overarching message that rose above the story and declared itself in large font. My rigid conception of coherence led me into trouble in those days. It was what allowed me to give overly high grades to the didactic diatribes of Crash, the blunt TED talk of Syriana, and the intermittently self-satisfied musings of Closer. I sound as harsh to myself now as I was to films like Triplets of Belleville back then. The truth is I still like all three of those films to varying degrees. Yes, I even still like parts of Crash. But my thirst for theme and message at that time in my life was also preventing me from giving proper credit to films that were more understated and enigmatic in their approach. To be clear, I still put a very high on premium on coherence and theme now, but I have made more room in my cineaste heart for ambiguity and that irreverent spirit that leads a filmmaker to deliberately confound the viewer; to challenge them by withholding easy explanation. I never saw a Paul Verhoeven film until I was a twenty-seven-year-old in law school and I am glad of that. That college kid, for all his rigor and for as much as he genuinely loved movies, would not have been ready. He would have myopically dismissed Starship Troopers as immature, when he was the one who still had growing up to do. I’m in a place now where I see that ideas can be teased out or hinted at rather than concisely explained. Films can be great for what they leave unsaid. A film can find brilliance in mystery and confusion. That sense of mystery is key to appreciating The Red Turtle, a delicate, emotionally rewarding animated film whose ideas about life, nature and death are as gently amorphous and as hard to pin down as wisps of smoke. The Red Turtle is the first full-length feature by the Dutch animator, Michael Dudok de Wit. 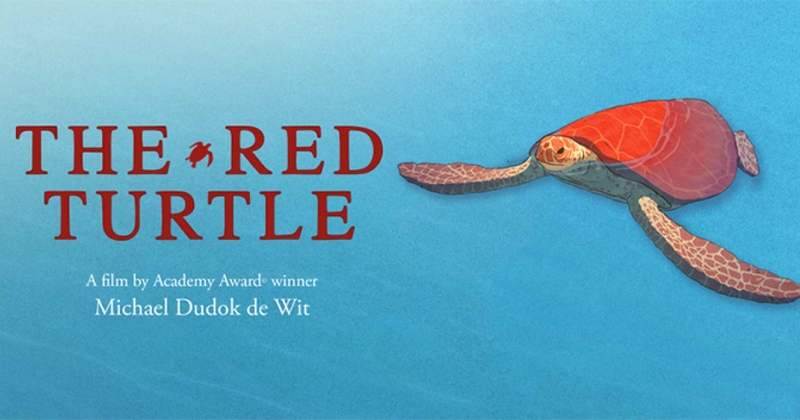 Dudok de Wit won the Oscar for Animated Short in 2000 for the elegantly simple, heartfelt Father and Daughter, about a little girl whose beloved parent leaves when she is a tender age, and who rides her bicycle to the same place throughout her life hoping to see him again. I have always thought highly of that beautiful short, but I held a very tiny axe to grind with it for beating out Don Hertzfeldt’s hilariously inventive and demented Rejected. Whatever small grudge I have held over a beautiful work of art beating out a brilliant work of art, I now lay it to rest. The Red Turtle is proof that Dudok de Wit is a great animator and the kind of sentimentalist I can get behind: soulful and devastatingly delicate. 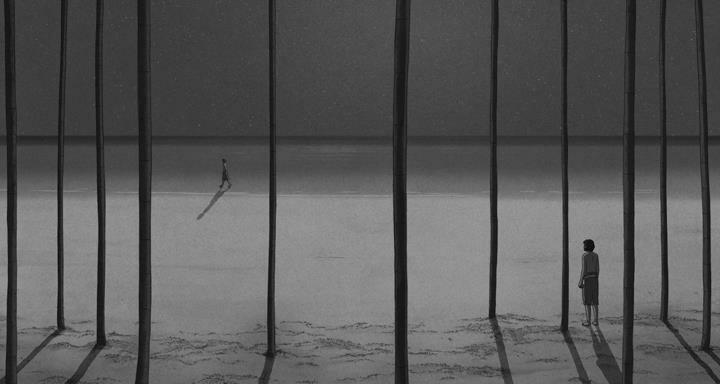 The film opens with the sound of the ocean, heaving and hissing over a black background. When we open our eyes, we are surrounded up to our heads in ferocious waves and pelted by relentless rains. It is also the dead of night. 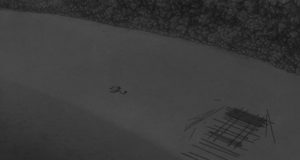 Our unnamed protagonist soon pops his head above the surf. He is a dark-haired, Caucasian man in his thirties, and he is struggling to keep from drowning. Among the dark swells and white crests, he eventually finds an overturned rowboat, which we assume must be his. He clings feebly to it as the dark, angry sea throws him onto the shore of a remote island. In the daylight, we see the island is very small. It has a beach and a rocky outcrop and, further inland, a bamboo forest, some grassy fields, and a freshwater pond. Its non-human residents include a cluster of curious sand crabs, a flock of birds, and a cantankerous grey seal. The Red Turtle is a film with effectively zero dialogue. Its only human utterances are the man’s angry or frustrated screams which are never more verbal than the word “hey”. He runs around the island trying to collect his bearings and desperately searching for food. He eventually finds a tree that provides coconuts. After taking his fill of food and water, his next thought is of leaving this desolate place. He starts gathering bamboo logs and fashions a crude raft. Once he sets out to sea, however, some unseen creature batters the underside of his raft and reduces it to driftwood. He swims back to the beach, screams exasperatedly at the crabs who shadow him, and almost immediately sets to making a new raft. When he heads out to sea again, the second raft meets with the same fate as the first one. On the next attempt, the man finally sees the beast that keeps preventing his escape. It is a large, vibrantly red sea turtle. After showing itself, the turtle destroys the raft a third time and swims up onto the beach. In a fit of anger, the man flips the turtle on its back, stomps on its stomach, screams at it and leaves it to die of exposure. As night falls, however, guilt overtakes him and he tries in vain to resuscitate his tormentor. He shakes the turtle and splashes it with sea water from a bamboo cup, but it is too late. The turtle is dead and the man falls to his knees in sorrow and shame. A fourth version of his raft sits half-finished on the edge of the frame. As he mourns the life he has taken, the underbelly of the turtle’s shell suddenly splits open. When the man looks at the cracked shell, the turtle is gone and a beautiful, red-headed woman now lies unconscious inside. The man rubs his eyes in disbelief and frantically runs for fresh water from the pond. When day breaks, he builds the woman a shelter of fronds and leaves to protect her from the glare of the sun. Eventually, the woman wakes up and wades out into the shallows. The man cautiously tries to coax her back onto land, as she repeatedly sinks and resurfaces in the low tide. When she pushes her old, discarded shell out to sea, he pushes the pieces of his raft out as a sign of trust. He no longer wishes to run away. The Red Turtle transitions from being a film about escaping a survival situation to a film about accepting one’s circumstances and finding a new life with another person. The woman comes to trust the man and treat him with kindness. She takes him out to a sand bar and shows him how to forage for mussels. The man is still wracked with guilt over his violence toward her, but she forgives and reassures him. They quickly fall in love. The two will spend a full life together on this island. They give birth to a child, who will eventually grow to be a man with something of his mother’s turtle essence. One day he will swim away from the island with a group of turtles and start a life of his own somewhere else. The Red Turtle is a gentle, humane, and sweetly melancholic fable about the full gamut of human life, playing out in a seemingly hostile place. 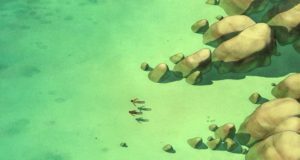 The Red Turtle is something of a simple film and that begins with its animation style. The characters are rendered like drawings out of a children’s storybook. Their eyes are nothing more than charcoal-black ovals. Their bodies are basic, two-dimensional sketches, and so is the environment they inhabit. But for all that simplicity, I will echo what a great many other critics have said: this is an incredibly expressive and vibrant piece of animation. As he did with Father and Daughter, Dudok de Wit knows that a simple sketch can be even more suggestive than a detailed image. We can see well enough that these are human figures and whatever they lack in finer detail only allows our imaginations to get more involved in filling them in. The characters may look like simple drawings, but their body language is subtle and natural and it conveys a wealth of information and emotion. This proves vital for a film with no dialogue. Likewise, the world of the island never feels flat for its simplicity. 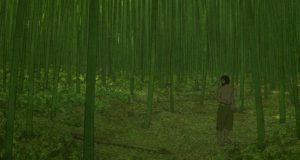 There is so much lush color and clean detail in that bamboo forest that it feels all-encompassing in spite of the fact it is a two-dimensional image. The same goes for the softly rustling meadows and the surf spraying off the rocks and the placid freshwater pond. The surface of the animation may be unadorned, but the whole landscape teems with tiny details. 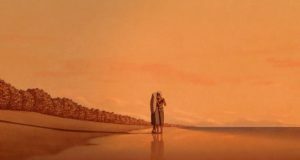 If Sunset Song captures the experience of reading a classic novel, The Red Turtle perfectly conveys what it is like to thumb through a lovely illustrated storybook. The Red Turtle is a wordless, spiritually soothing experience, but it does have deeper themes, or at least thematic motifs that waft through the film like gentle island zephyrs. I would say the largest theme is the question of what makes a life; the idea that your life is whatever simple joys you find while alive and that existence can be beautiful and fulfilling even when your greater plans get swept out to sea. In this regard, The Red Turtle shares a thematic thread with this year’s Passengers, a film that it bests in every possible way. After spending the first half of the film shouting inarticulately at the heavens and frantically seeking escape, the man finally comes to see that he can be happy right where he is. Here, it is probably valuable to see the film as a fable or an allegory, as I obviously wouldn’t begrudge anyone trying to get back to civilization if they were marooned on an actual deserted island. 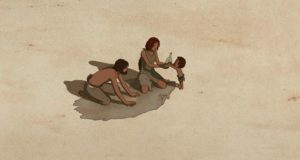 But in the context of the film, the island is an opportunity for the man to see that life is all around him and that he can experience connection and growth even in this most seemingly inhospitable of places. He can even find family. The man and the turtle, who becomes the woman who becomes the love of his life, experience the joys and hardships and occasional disasters of a full human life, all in a tiny pocket of the world and all over the course of an 80-minute film. This idea is not hammered into anything resembling a thesis statement, but it is there to be taken in whatever way the viewer wishes. 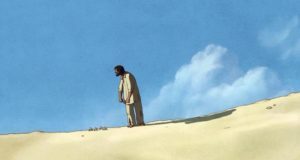 Saying that a film is just about life can often feel like a bit of a cop-out, but The Red Turtle bathes itself in the stuff of life and does so without grandstanding or resorting to sweeping statements. It is not the kind of film to make points, but its small, understated observations of life and nature hold a great deal of serene wisdom. And this understated approach is very well calibrated to Dudok de Wit’s unassuming, emotionally direct style of animation. Dudok de Wit places his protagonist in the midst of nature, and he has the invaluable aid of animators from Studio Ghibli, home of anime laureates like Hayao Miyazaki and Isao Takahata, to help create wonderful images of nature. 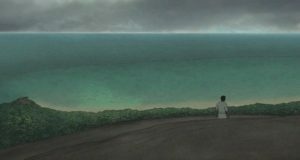 The Red Turtle has much in common with a Miyazaki film, in its peaceful tone and especially in its love for the beauty and magic of the natural world. 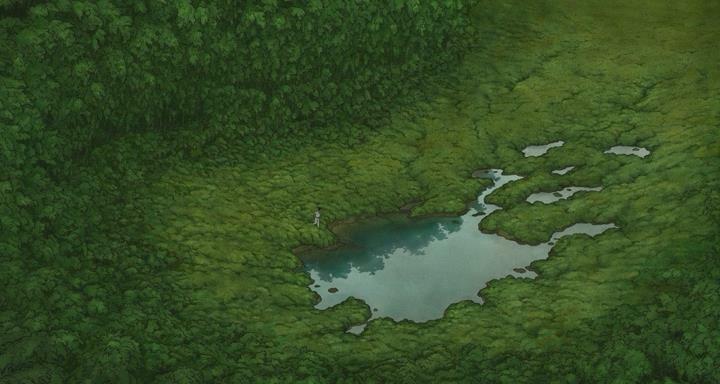 In Miyazaki films, mankind has a fractured relationship with the land and sea but is also permanently and inextricably bound to it. The Red Turtle is very much about humanity’s relationship to nature and the virtues of tending to that bond. At the film’s halfway point, we see the man make his fateful decision. He stops turning his back on the turtle and atones for his violence against nature. It is in trying to save the turtle and asking penance for his cruelty that the man finds a kind of love that he never knew existed. This love takes the form of a woman who becomes his romantic partner, but that woman is also still the turtle deep down inside, and maybe all of this could just be a love within the man’s own soul. A love for one’s self. I think the film is saying that all these kinds of love are equally valuable and rewarding. In the end, this is a fable, so how real or illusory any part of the story is seems beyond the point. It is a piece of mythical fiction intended to make us think about our own relationships with other people, nature and ourselves. 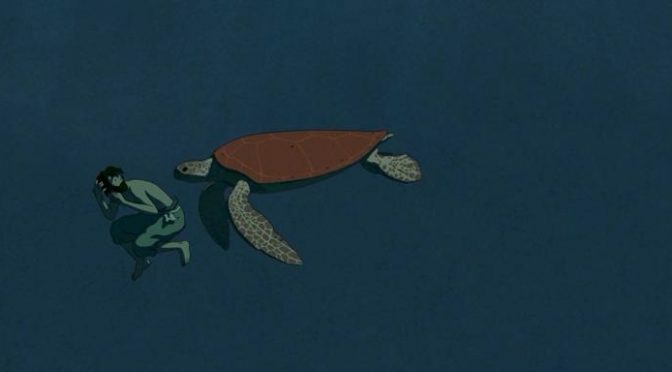 The Red Turtle seems to suggest that, just as life is where you find it, maybe love is to be treasured in whatever form it takes. 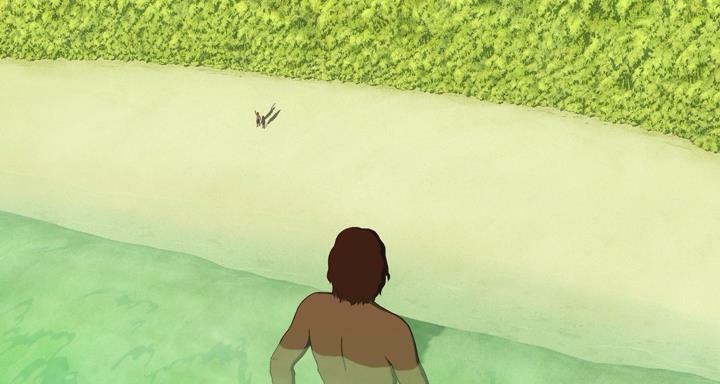 On second thought, I regret ever suggesting that The Red Turtle is less than coherent. More accurately, I would say it’s more than coherent, or perhaps above coherence. The film is cohesive but I think Dudok de Wit and his animators would find a term like “coherence” unbearably rigid and restrictive for what they have in mind. Part of that is because The Red Turtle is about life and life cannot be easily contained by academic words like “coherence”. Another reason is that the film’s refusal to spell out its ideas helps to create a sense of amorphous, undulating mystery that is key to its emotional effect. 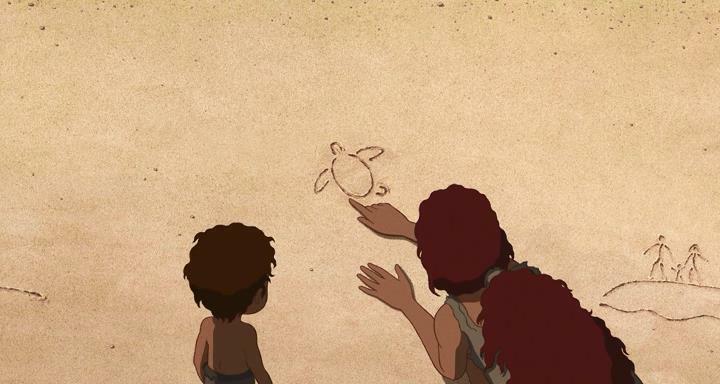 If I haven’t made it clear at this point, The Red Turtle is the kind of film that gently, but firmly seizes your heart. Helping with this coup is Laurent Perez del Mar’s yearning score, which evokes a maritime, magical realist Ennio Morricone. The film is very much what one might call a tone poem. Yes, there are ideas and themes, but they are not the purpose of the thing. They float by us and around us like bamboo logs in the aftermath of a tsunami. 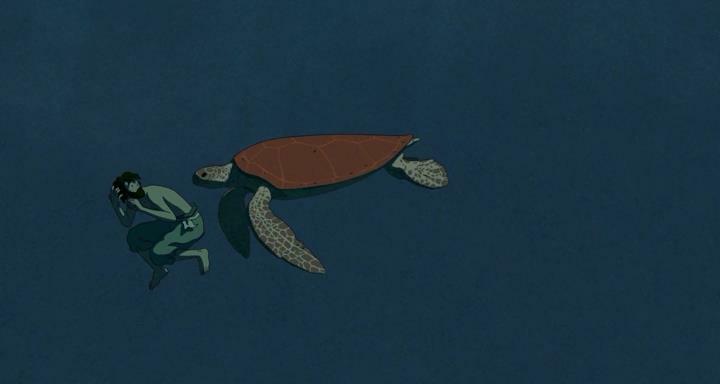 We grasp onto these fixed concepts to steady ourselves, but The Red Turtle implies that life is not about feeling steady or certain. Perhaps our natural state is just to feel confused and curious and overcome by emotion. 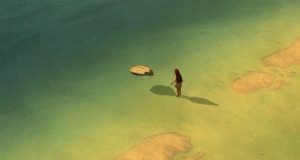 While I tried to wrangle The Red Turtle into positions that would fit easily into a film review, I started to realize that its real goal wasn’t to expound on anything too specific. Instead, the film’s goal was to make me feel what it is to be alive, not with intellectual pontificating but by jamming the porcupine quill of sweet, fragile, impermanent life under my skin. 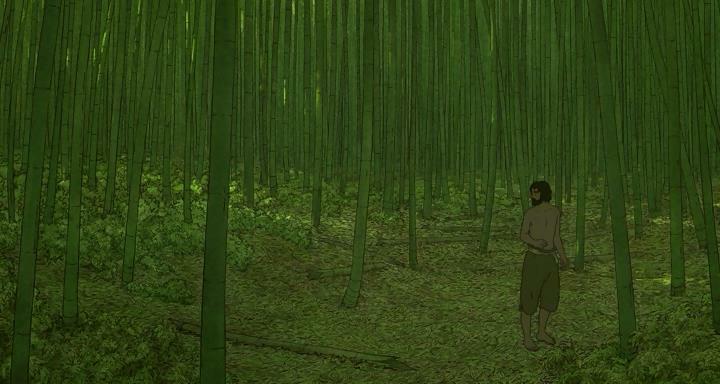 The Red Turtle is about capturing the throbbing ache of being and knowing that nothing lasts. It made me feel that mixture of love and faint sadness I get whenever I yell at my sweet, misbehaving dog. I experience a burst of anger and that soon gives way to a dull sense of melancholy. Because, even though the unruly moppet deserved his scolding, I also love this dumb creature and don’t like to feel harshness in myself. And because he makes me feel happy most of the time and life is short – mine and especially his- and there’s just so much good about being alive that those bursts of ire feel like tiny tears in a blanket that there isn’t nearly enough of to begin with. Stupid dog, stupid life. I love you more than I can say and it breaks my heart to know that one day you’ll be gone. 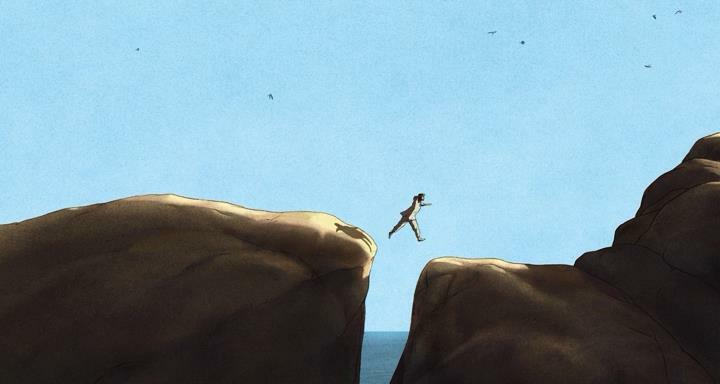 Like life, The Red Turtle is a film to be experienced and felt. I still watch films to get them, to figure them out. I have never once done this in an outwardly greedy or acquisitive way. I do not go into any movie with the goal of avariciously ingesting its ideas and moving on. Nonetheless, there is a fidgety curiosity in me that makes me want to turn a film over and inspect it with a meticulous eye, and that can be a reductive way to see a beautiful piece of art. Films are not resources to be mined. The Red Turtle reminded me of how restless I can be, both as a watcher of films and as a human being. On my first and even second viewing, a part of me wanted to possess the film and understand it more fully. But the film just wanted me to reflect and feel and know that not everything can or should be crushed down into some concise kernel of knowledge. Even now, there is something about The Red Turtle that eludes my grasp, expanding outward the more I try to corral it, but I have come to love the film for that very quality. I am no longer pressed by the need to figure it out. To figure a thing out completely is to be done with it, and I am no more eager to be done with this entrancing little fable than I am to be done with life itself. There is a subtle tension throughout the film, a sort of suspense that keeps you wondering. There’s an eco-message here, of course, but it’s not heavy-handed. 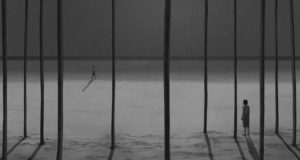 The filmmaker simply shows the enchanted environment, in all its beauty and wonder, and lets the viewer interpret the wordless story on his or her own terms.